S.S.C. '14 is the next entry in the Super Soccer Champs game series from Uprising Games, offering gamers the next retro-style footie game for the iOS platform. That's saying something actually - you see the S.S.C. series is inspired by the classics like Sensible Soccer, Kick-Off, and Goal! If you are not familiar with those titles, it'll put you in mind of the message by understanding that those games - like S.S.C. - are fast-paced and complete footie experiences. What S.S.C. does however is take that rather exciting retro game play style and brings it to the iOS mobile gaming platforms. 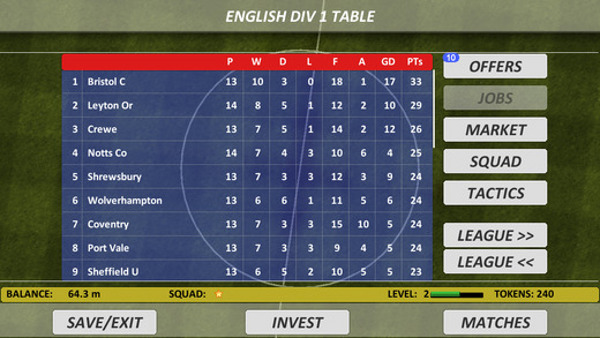 Each new version of the game offers more leagues and a deeper Career mode, with improved graphics, sound, and game play. There are two versions of the game available - the Free version and the Premium version. The Free version offers players full game play, with most of the features of the premium version, with a bunch of in-game purchases including: VIP Status, Coins, and the different levels of Tokens that are used to build the best team you can manage. The Premium version (cost is .99 cents) also includes in-game purchase of VIP Status, and Tokens for expansion, but coin is earned there which nicely expands game play options. Game play is divided between World of S.S.C. (your league mode), Single Match, Single League, and Retro Champs. The leagues available for play include England Elite, English Champo, English Division 1, English Division 2, Liga Espana, Serie Italia, Bundas Ein, Francais Un, Highland Prem, and Japan Pro Soccer.Basically that's English, Spanish, Italian, German, French, and Japanese League play! Game play in your chosen division / league consists of management and play. On the management side you are responsible for trades - both to and away - in order to build the best team that you can within the budget available for your chosen team. Game play is an intuitive two-thumps on the corner of the screen romp that offers a brisk passing game and a play style that is both easy to learn and easy to master. Thanks to the timed games and matches the game is very accessible for pros and casual players. As you work your way through the matches proper management ends up representing half of the game, thanks to needing to manage the injury list while fielding a full team, and promoting your best players. But the flip side - playing footie - makes the detail work in management all the sweeter as you reap the benefits of your work. 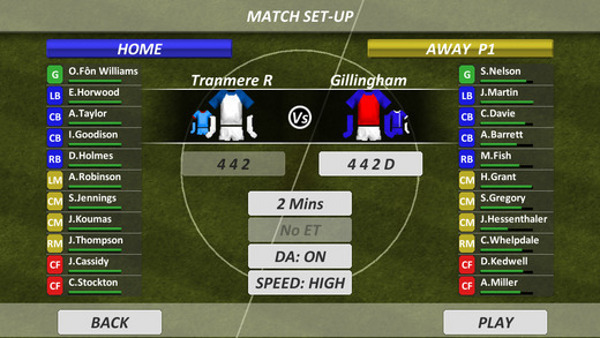 Among the improvements in this new version is a much larger pitch, with finer details. The biggest difference - and improvement - is down to the player movement. Specifically the finer control and action that the closer graphics adds means faster passing, and more opportunities to shoot (and more opportunities to foul but we won't go there). The music side of the game is predictable with upbeat electronic but the primary background sounds are the crowd noises. In '14 the fans actually react to the action on the screen, which is rather cool. Considering the low price of the game - the Premium version is just .99 cents - what you get for that is a very addictive and fun footie play that provides just the sort of bite-sized play that mobile gamers are looking for. While the game includes in-game purchases that do help expand game play options and your team, it is not really required to obtain full value from the game, and full entertainment value as well. Your brother has been kidnapped and now .. Build a mighty empire, forge alliances, ..